12/2014 – Yogyakarta, Java, Indonesia. 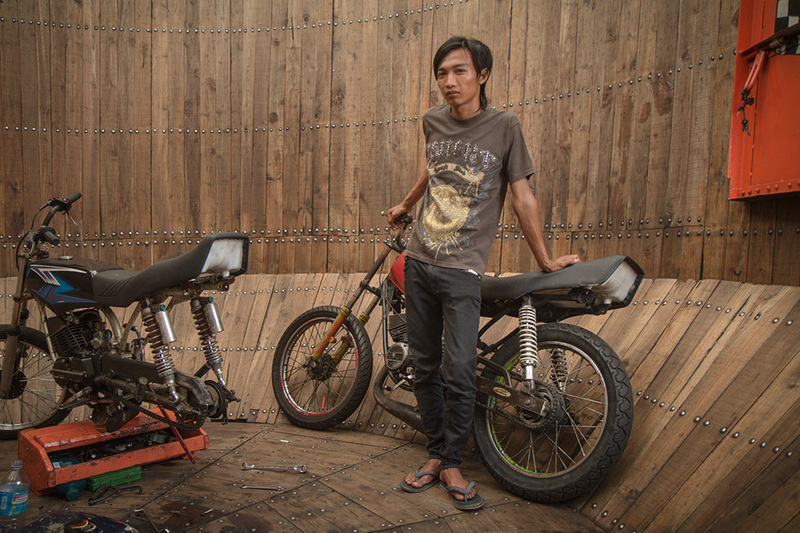 My short documentary on Indonesian daredevils on Wall of Death presented by Nowness. 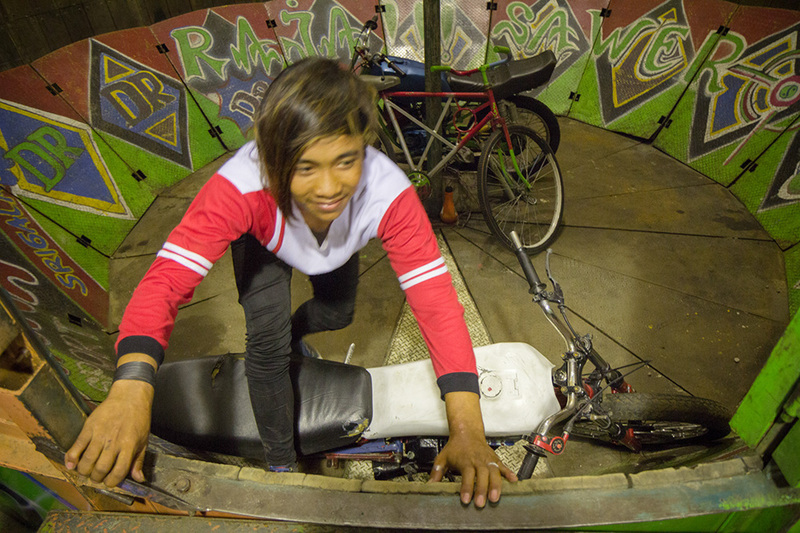 “Accidents here actually can be fatal, and my family wasn’t really happy about what I do but I had no other option where to work so… they get used to it at the end.” Mulyorahadi (29) has been riding since 2002, and recently survived a tire rip during a live show. To mark the beginning of Javanese New Year citizens of Yogyakarta hold the annual Sekaten – a kind of fun fair and night market open for the first few weeks of November as part of the celebration of the birth of the Prophet Muhammad. As the sun sinks into the Indian Ocean just beyond the outskirts of the city, the electric lights burst into life. Almost immediately Sekaten overwhelms your senses with its lights, sounds and smells. The brighter, the louder and the flashier; the better. This simple rule dictates the style of every attraction here and there is nothing louder than the combination of roaring engines and booming beats blasted out of massive sound systems. It is to this sensory assault that the riders of Tong Setan begin to rev their engines. 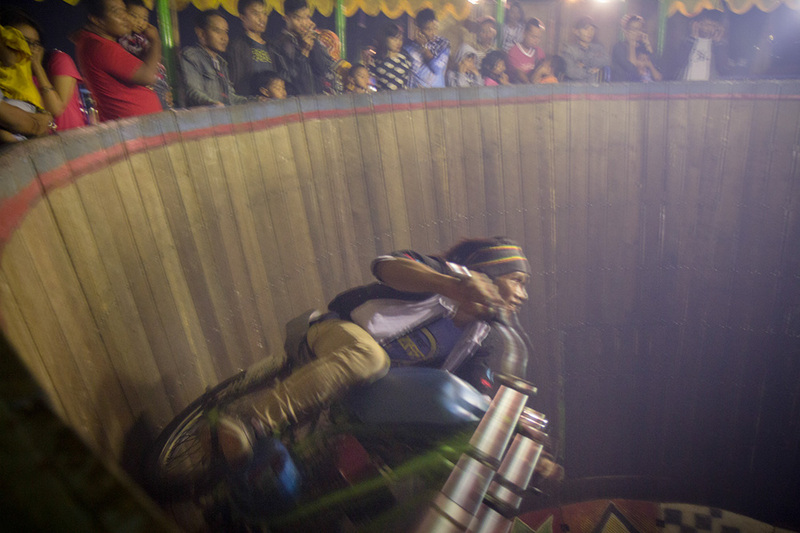 Known in Indonesia as Tong Setan, Roda-Roda Gila or more bluntly “Wall of Death”, the history of this carnival attraction dates back to the beginning of 20th century and remains phenomenally popular today. 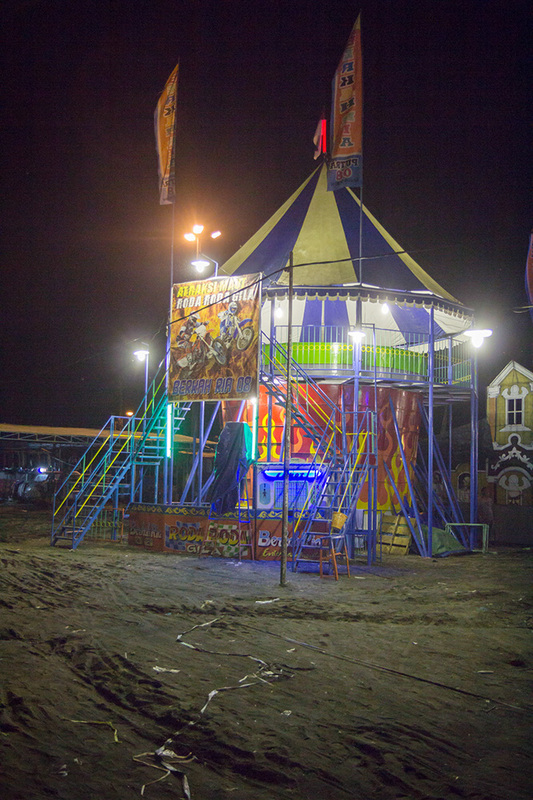 Built from wood and steel over a period of about 2 days, the barrel like construction stands 7m high, with a top diameter of 6m, a narrower base and a spectator viewing area on the top. 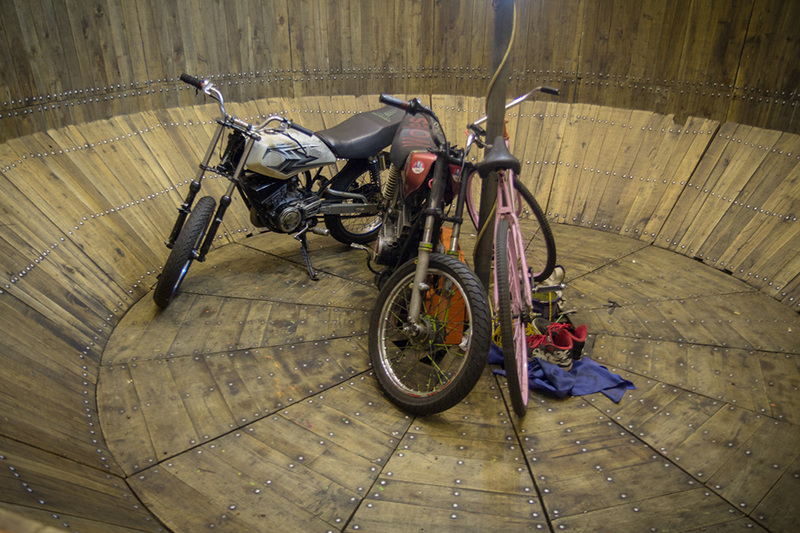 Riders start at the bottom part of barrel and accelerate until centrifugal force allows them to ride horizontally. A top speed of 50km/h sends them spinning round the top of the barrel. As if it wasn‘t risky enough a third rider joins the foray; a cyclist on a fixie. Helmets are tossed aside; riders themselves claim aesthetics matter. 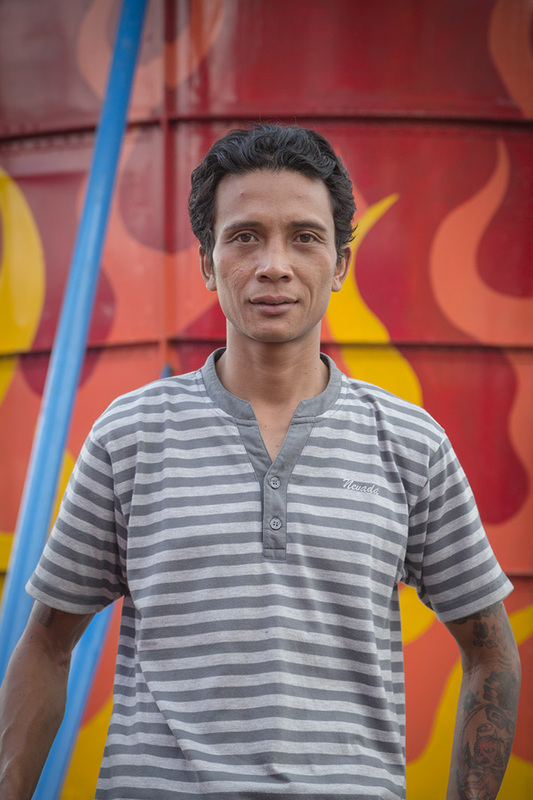 Eko (25) started work at the carnival as an operator and worked his way up to the wall as riders moved to different parts of Indonesia. “It took me about one month to gain needed skill and confidence. After that another 3 months to synchronize with others and smooth things up so I was ready for the show.” He says, lighting up another clove cigarette. Acrid smoke billows out of their two-stroke engines immediately filling the barrel and the spectator viewing area. 135ccm Yamaha’s RX King seems to be the surest bet amongst riders on the wall, as well as other Indonesian rebels who love to tinker with these machines for the fastest ride in outlawed street drag races. 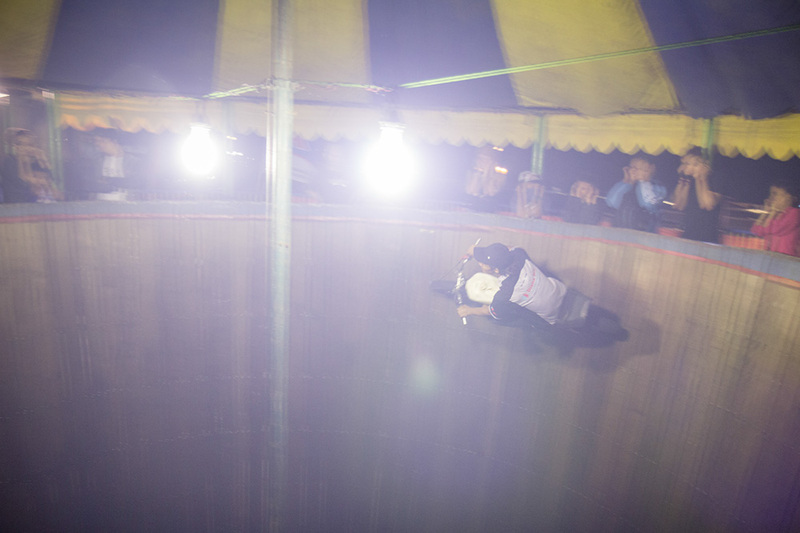 Stunt men like Eko and Mulyorahadi travel around the whole country to satisfy crowds with up to 7 shows every night. 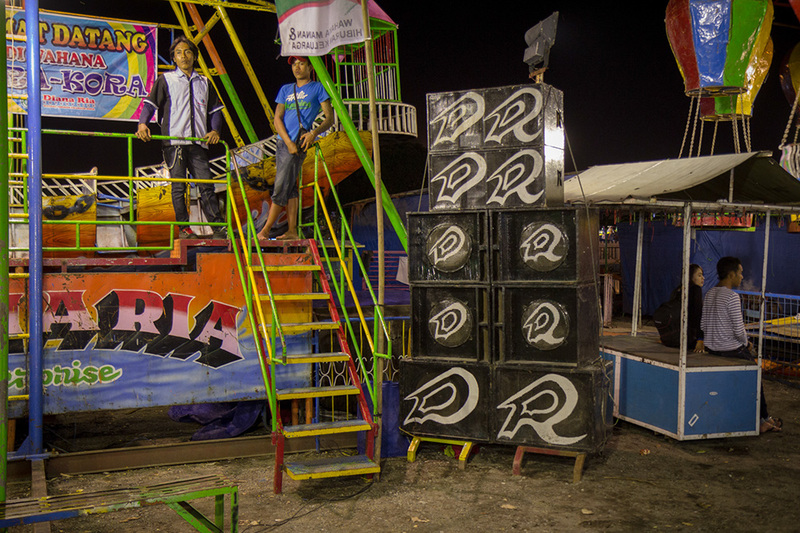 An entrance fee of 8000 Rp (about 75 USD cents) isn’t sufficient income for the riders and so they supplement their income with the tips dangled from the hands of spectators; baiting the riders to ride higher and faster. 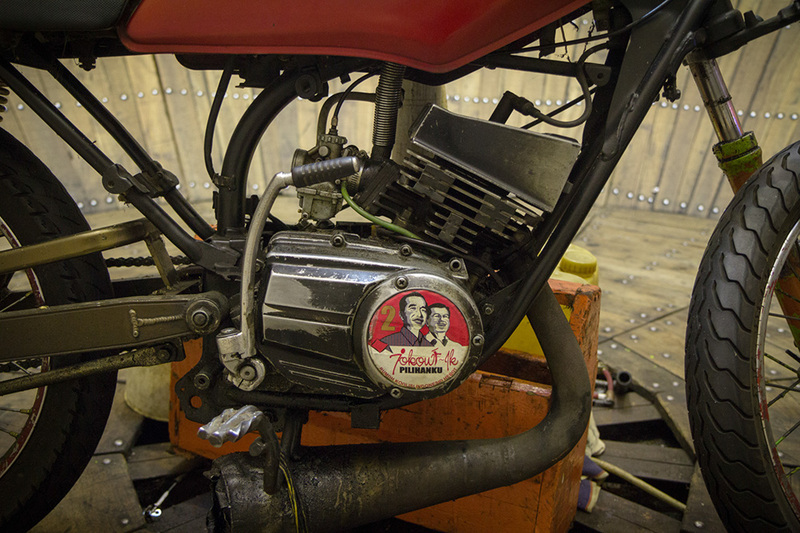 The Indonesian archipelago is teeming with over 70 million motorcycles. With this many riders it is the perfect setting to appreciating this engrossing night time spectacle; one that really must be seen to be believed. 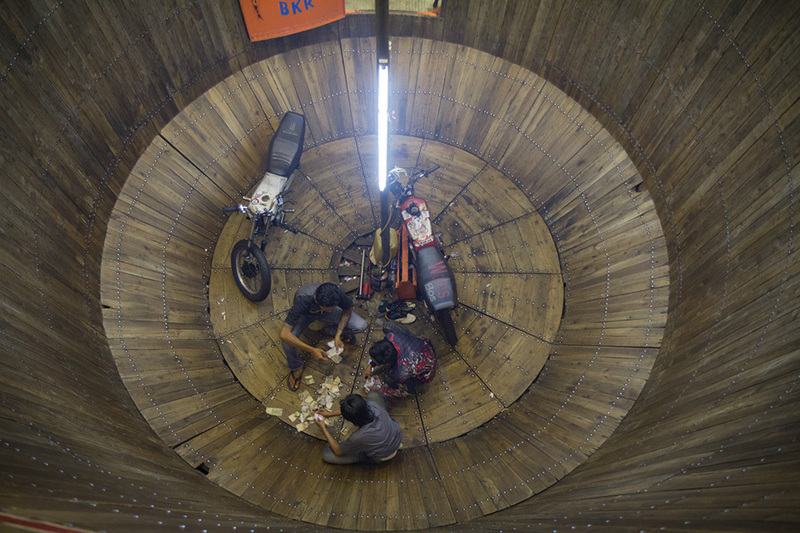 Eko inside the wooden barrel construction where he rides and repair his bike and sometimes sleep with his family. Sticker with Jokowi, an Indonesian president. Boomboxes of Sekaten. Yogyakarta, Indonesia.